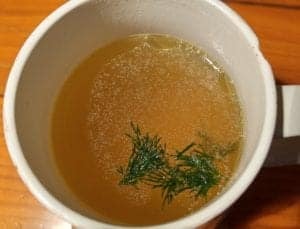 Many people (including me) are sick with the flu and many are sipping soup, because it is warm and comforting and provides them with some protein, vitamins and minerals. I’m drinking chicken soup, made from my grandmother’s recipe and this isn’t any chicken soup, as you will soon find out. Whenever someone in my family is sick, it’s me they turn to for chicken soup — but not just any chicken soup, but the one I learned how to make at my grandmother’s knee. This soup is purported to have curative effects and it must have had something because my Bubby (‘grandmother’) lived until 104 years old and was in very good health until a few months before she passed away (2013). My grandmother used to joke that she “didn’t lose her marbles” and to be honest, she had more “marbles” at 104 than many do at half that age. Her chicken soup was amazing — nothing like any similarly named broths by Lipton®’s or Campbell®’s. 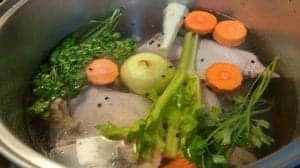 Bubby’s Chicken Soup was made with love, care and the best of ingredients and was the epitome of what has become known as, “Jewish penicillin”. I still have vivid memories from when I was a little girl of going to the market with my grandmother to pick out a live chicken. She always served her chicken soup in a “soup plate”, like this and the spoon was deep and round, like a miniature bowl with a handle. I wonder if she’d be horrified that I drink mine out of a coffee mug! 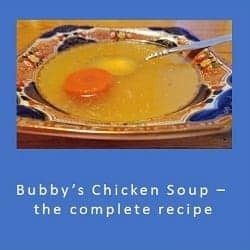 The first question many people ask me when I talk about my Bubby’s Chicken Soup is “what makes Jewish chicken soup different“? No, the chickens aren’t “Jewish” (!) 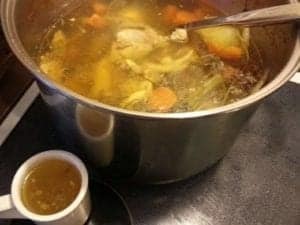 — although a kosher soup chicken does make the most amazing broth. 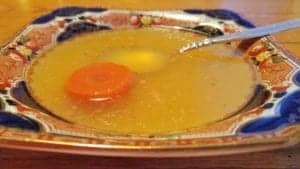 It is the special type of chicken that this soup is made from (and a few other special ingredients that I’ll tell you about shortly) that contribute collagen and natural gelatin and result in the chilled broth being like very firm Jello®. A “soup chicken” (also known as a “stewing hen“) is essential for making this soup. A “roaster” or “broiler” simply won’t do! They are too young and have too much fat, too much ‘meat’ and too little flavor. 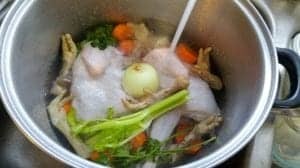 A soup chicken is an old bird that has outlived its usefulness for laying eggs and it’s the age of the chicken that makes it perfect for making soup, because although the meat is tough it makes the best soup. Old laying hen hav lots of connective tissue and collagen, and it’s this which makes the resulting broth very different. This, and the addition of chicken feet. Yes, chicken feet. As my grandmother did, I chop the nails off of them before making soup, but many butchers that sell them, will do this for you, if you ask. One can often find ‘soup chickens’ or ‘stewing chickens’ at independent ethnic butchers or at small supermarkets with a large ethnic clientele and these same markets often sell chicken feet, too. 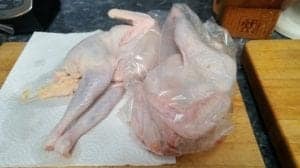 As you can see from the photo above, soup chickens are small and don’t have hormone-enlarged breasts- in fact, they have very little meat at all, and have almost no fat under the skin. It’s these factors (plus the addition of the feet) that result in the the chilled broth being so gelatinous, with the minimum of fat on it. 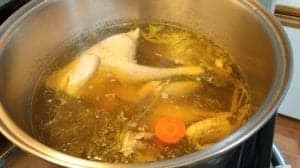 Jewish Chicken Soup is the original “bone broth”. 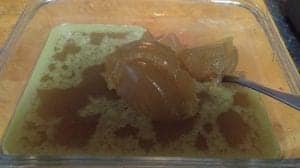 Most people would never give out their grandmother’s family recipe, but since not everyone had a Jewish grandmother, I thought I’d share mine with you, along with her wonderful recipe for soup! 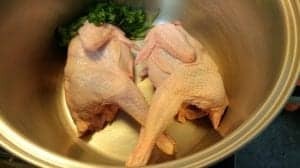 1 – Put two of the stewing chickens at the bottom of a very large stock pot. 2- Toss the vegetables on top, then the chicken feet. 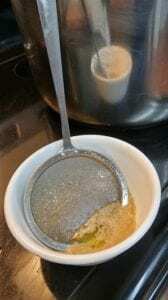 Cover with very cold water and add salt. Be careful not to put in too much water, otherwise the broth won’t have the correct taste, body or colour. Gently slip in the 3rd soup chicken. 3 – Bring to a boil over medium high heat, skimming off foam with a small mesh designed for this purpose, until it stops producing foam. 4 – Lower heat to medium low and simmer soup for at least 8-10 hours, overnight if possible. 5- Strain the broth through a large colander into another pot (so you only have the rich golden liquid). Pick out the carrot chunks from the colander, and serve with the clear broth. Garnish with fresh dill. 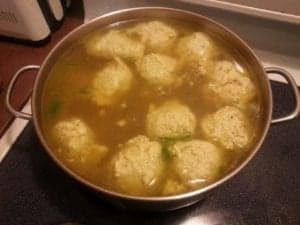 Note: for those that are not following a low carbohydrate / ketogenic lifestyle, this soup can also form the basis for “matzoh ball soup”. Previous PostPrevious What Regulates Body Weight?